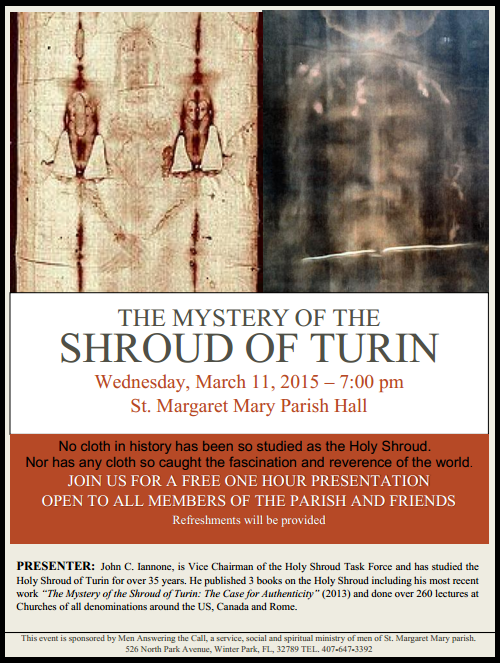 From an entry in the website of St. Margaret Mary Catholic Church in Winter Park, Florida, we learn that John C. Iannone, author of The Mystery of the Shroud of Turin: The Case for Authenticity, will be presenting in the parish hall on Wednesday, March 11, 2015 at 7:00 pm. Click on the poster for an enlarged view. Hi Rick. Unfortunately, there are two major errors in your posting. ONE: I did not DISMISS the Tilma but simply stated that I did not believe it would withstand the same scientific scrutiny as the Shroud. TWO: My comment was NOT based on “secondhand comments I had heard…” but on all the scientific data presented by three experts on the Tilma from Mexico City who presented it to a group of Shroud scholars at a conference held in Jerusalem over a period of 5 days in 2013. Here’s a link to an article about that conference with the details and the names of all the experts in attendance: http://www.shroud.com/late13.htm#3rd3. No rush to judgment here. Just my personal opinion based on that data. My professor of Parapsychology was one of those who studied the tilma in Mexico as part of his research into “supranormal” phenomena, defined as a power from beyond acting in our world. He believed it was “supranormal” and we discussed the topic for a while. It seems the original image will have to await better analysis when what was painted over it is turned into flakes. That merely confirms what Dr. Phil Calahan said after his study.